This post contains affiliate links which helps support this blog. See full legal disclosure here. Now that we’re a good three months into our school year, I wanted to do a short series on our Morning Meeting time for this year. It usually takes me a couple of months to iron the kinks out of everything we’re using, get the scheduling down just right, and replace resources that didn’t work for ones that will. Hopefully that’s encouraging to some of you that despite seven years of homeschooling I still need a few months to get things clicking on all cylinders! The first major change for the year was that Morning Meeting had a name change. Grace would always tease me that Morning Meeting would usually occur in the afternoon and sometimes even at night: “It’s not really Morning Meeting, Mom, if we don’t do it in the morning.” Point taken. 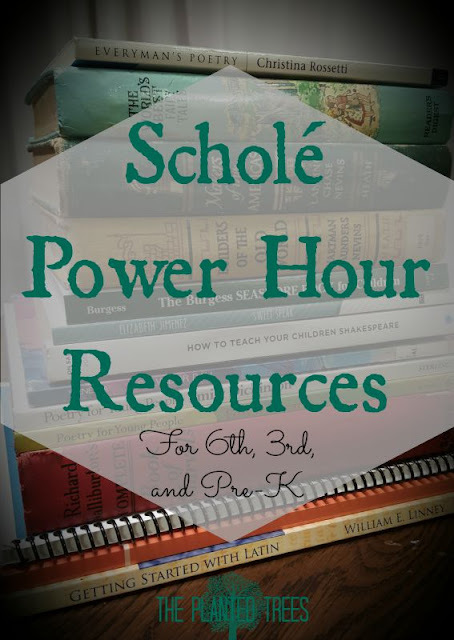 So I began to think about new names for that time of our school day when I came across the term Power Hour from Jen’s blog, Forever, For Always…No Matter What. I loved the name and it addressed something else that had been bothering me about our Morning Meeting time: length. So the next change I made was being determined to pare down our Morning Meeting time to fit within an hour time constraint. While our normal time of an hour and a half to two hours wasn’t necessarily bad, it just took a large part of our day, and I felt like I needed a nap after all that reading to the kids and keeping Levi from running amok. After some trial and error, I’ve been able to trim everything down to fit within an hour or an hour and fifteen minutes. I even set a timer for the first few weeks to make sure that I was keeping true to my vision for our new and improved Power Hour part of the day! So now for the fun part: book list! Listed below are the resources that I'm using with my kids this year during our Power Hour time. These resources are for the ENTIRE year so don't look at the list and panic. In the next post about our Power Hour time, I'll show how all of these are scheduled over the week and over the year. Believe it or not this is the list that's been culled to keep restful learning happening around here. Bible Study Guide for All Ages: We have used and loved this Bible program since we started homeschooling. You can see my review here. Sweet Speak by Elizabeth Jimenez: While this book is geared toward teenage girls, the content is fabulous for anyone to learn how to let their words be words that build instead of destroy. I chose this for us to read through and discuss together because we ALL need this study around here! Poetry for Young People: Emily Dickinson and Poetry for Young People: Edward Lear: The Poetry for Young People series is one of my most favorite finds since we started homeschooling. These books make studying and reading poetry painless since they have notes about the poems, bio about the poet, and definitions of words included in the text. Sing Song by Christina Rossetti: This collection of poems should be a staple in your home if you have younger children. All of the above poetry books are meant to be read for enjoyment over the course of the year, but to actually study poetry I'm using the following book from Memoria Press. Poetry for the Grammar Stage: We'll only be covering the third grade poems this year, one each term. Visits to the Middle East by Sonya Shafer: I've been so impressed with how easy these books make learning geography. This year we are focusing on the Middle East, but I plan to continue the series with my kids because it's so effective. The Complete Book of Marvels by Richard Halliburton: I grabbed this book about two years ago and immediately fell in love with this amazing living geography book. Copies are sometimes difficult to find and can be pricey, but it's well worth it if you can find a copy within your budget. The Glorious Adventure by Richard Halliburton: In this book, Halliburton, an adventurer from the early 20th century, follows the path of Odysseus' journey from Troy back to his home in Greece. I thought this would be the perfect way to finish up our study of geography for the year. Makers of the Americas by Marion Lansing: This is the American history overview book from the History on the March series. This series is out of print, but you can usually find copies of the books for pretty cheap on the internet. The Burgess Seashore Book for Children by Thornton Burgess: Since our main science focus this year is on the ocean, adding this book to Power Hour was a no-brainer. It's a classic! Lives of the Scientists by Kathleen Krull: I discovered this book at our library and fell in love. It's fun, informative, and has great pictures. Fifty Famous Stories Retold by James Baldwin: A classic book that covers famous myths and tales. The World's Best Fairy Tales (Reader's Digest Anthology): I know, I know. A Reader's Digest book? Honestly, though, this collection is fabulous and you can find the book for cheap! It is actually a two volume collection, but I only have the second volume which is awesome by itself. Where the Mountain Meets the Moon by Grace Lin: An amazing book that weaves Chinese folktales into a great adventure story. Artists we are covering: 20th Century Artists (Jackson Pollock, Salvador Dali, Andy Warhol, Wassily Kandinsky, and Jasper Johns), Van Gogh, Georgia O'Keefe, and Claude Monet. I use Mike Venezia books to give background on the artist and choose five paintings for us to study from each artist, except the 20th Century Artist study where we only study two painting from each artist. 21 Lessons in 20th Century American Music by Gena at I Choose Joy: This is probably one of the things I'm most excited about this year! While I want my kids to know about the greats of classical music, American music did some amazing world changing things during the 20th century and this curriculum makes it easy to teach and learn about the different genres, composers, and artists that lived during this time. A fun, modern way to do music appreciation! Getting Started with Latin by William E. Linney: We are having so much fun using this book. It's easy to teach even for someone with no previous Latin exposure (me!) and presents Latin in small bite size pieces. Philosophy for Kids: 40 Fun Questions That Help You Wonder About Everything! by David White: We're only doing one question each week, but this book has brought some great discussion about right, wrong, truth, ethics, etc. to our Power Hour time. Highly recommend! How to Teach Your Children Shakespeare by Ken Ludwig: I think this book has become a staple of homeschool families. It's wonderful for introducing children to the Bard and helping them memorize passages from his most famous plays. It looks like a lot to get through, huh? I promise that it's not with a little bit of scheduling, so stay tuned for part two where I show how I take all of this and turn it into a workable plan that doesn't feel rushed or strained. What’s your favorite Morning Meeting/Power Hour resource? Let me know in the comments below because I’m always looking for new resources! I picked up How to Teach Children Shakespeare last year - great resource! It takes a bit of that fear out of teaching what can be an intimidating subject and makes it manageable. It's a fabulous book. I'm glad you got your hands on a copy! It's fun to see that there's a lot of overlap between your Power Hour (I like that, btw) and ours. One thing that we've found fun is doing math too - making it fun with puzzles. We love Mind Benders and The Moscow Puzzles for this. I like how you've included geography. I'm going to have to try that! I'm a geography lover! Probably my favorite subject to teach and study so I had to include it in Power Hour.